Ball end magnetorheological finishing (BEMRF) is a novel method for nanofinishing of ferromagnetic as well as nonmagnetic materials. With increasing demands of precision finished products in various markets, the quality of surface finish and production rate are of prime importance. For products having complex geometries, this need intensifies as the manual finishing methods are incapable of producing uniform finish throughout the complex geometry of the surface. 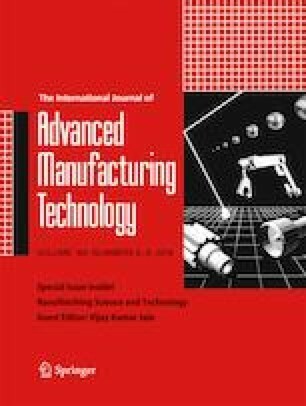 This paper describes the finishing of 3D surfaces using five-axis CNC BEMRF process in a fully automated manner such that a uniform finish is obtained throughout the workpiece. This eliminates the labor-intensive efforts and the subjective errors involved in manual finishing operations and increases the production rate of the finished products. A customized five-axis CNC controller is developed that enables the sequential and precise control of motion as well as process parameters in the BEMRF machine. The magnetizing current which governs the forces responsible for finishing in BEMRF process is controlled in-process through CNC part program using a specially defined “E” code for magnetizing current. A dedicated graphical user interface is also developed in Visual C# for the control of BEMRF process, enabling the user to make use of BEMRF machine without going into the complexities of the system. Using the customized five-axis CNC controller, automated finishing of a freeform mild steel workpiece is done. The finishing results obtained by the automated five-axis BEMRF machine shows uniformly finished surface profile (up to order of nanometer) on the mild steel test specimen.